How can I Send Messages Manually? Click on the “Registrations” tab. 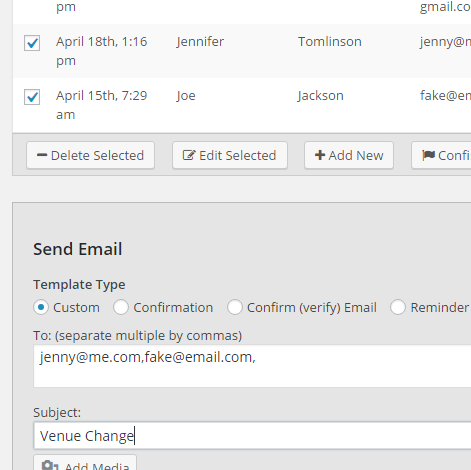 Find the event you would like to send messages for and click on the event title link or the “Detailed View” button. If your messages are sent, you will receive a notice right above the email sending form. Please note that many hosts have limits to how many emails you send. Please see our guide on setting up a third party emailing service for a better experience using the email features of the plugin. There isn’t a way to use the free plugin to send messages manually but you could use the “export .csv” feature to export a list of your registrants along with their email addresses. Then you could open the .csv file in excel or google sheets, copy all of the emails in the appropriate column, and then use gmail or something similar to paste the email addresses in the “bcc” field and send everyone a message. Using the “bcc” field is ideal because this will not reveal the email addresses to all registrants. If you want to send a manual confirmation email, you could first disable the confirmation email by checking the box “Disable Confirmation Email” on the “Email” tab in the registrations plugin settings area. Then you can use the steps above.